The Roman Catholic Cemetery in Nehru Nagar, Agra, harks back to a time when the many princely states that eventually united to become India had merchants and settlers originating from all over Europe, before the British had a death grip on the subcontinent. These people migrated to India attracted by the remarkable religious freedom India offered, regular pay, and overall better prospects, and found employment under various Indian courts. Eventually, they became so attached to the local culture, they married local women and adopted many of their customs such as clothing, food and lifestyle. Even the tombs became a curious blend of European and late Mughal architecture. One particular tomb—the main attraction of the cemetery—is the tomb of John Hessing, commissioned by his wife, Ann Hessing. 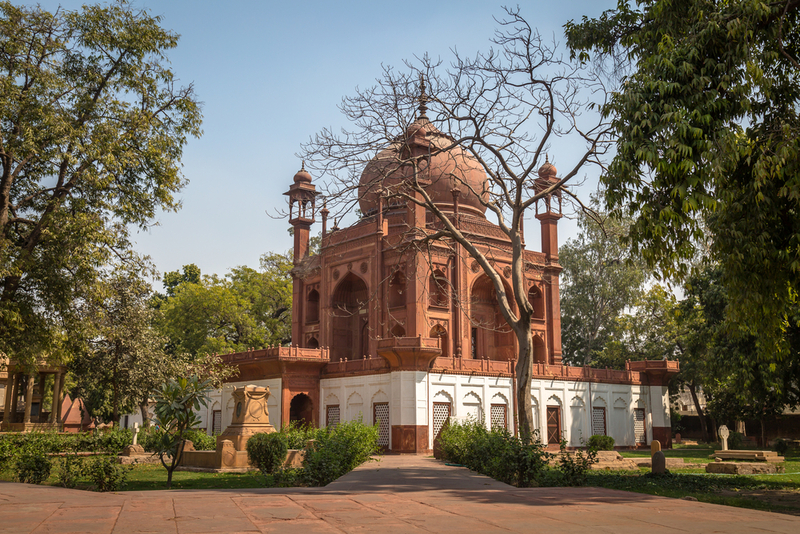 Built of red sandstone, the tomb was heavily inspired by the Taj Mahal with an identical square plinth and a large arch-shaped doorway, called an iwan, flanked by ornamental double alcoves on either side. This is topped by a large dome with a knobbed spire. Slender turrets rise from the four corners of the structure, crowned by beautiful square chhatris. The design is essentially Mughal, although John Hessing was Christian. John Hessing was born in Utrecht in 1739. He entered the military service of the VOC (United Dutch East India Company) at an early age of thirteen and arrived in Ceylon in 1752. Five years later, Hessing went back to the Netherlands. But after a decade, in 1763, he returned to India and served under the Nizam of Hyderabad. In the year 1784;, he entered into the service of Madho Rao Sindhia and was engaged in the several battles that led to the aggrandizement of that Chief and wherein he signalized himself so by his bravery as to gain the esteem and approbation of his employer, more particularly at the battle of Bhondagaon near Agra in the year 1787, which took place between this Chief and Nawab Ismael Beg, when he then became a Captain, and was severely wounded. On the death of Madho Rao Sindhia in 1793, he continued under his successor, Daulat Rao Sindhia, and in 1798 he attained to the rank of Colonel and immediately after to the command of the Fort and City of Agra, which he held to his death. At that time, it was common for Europeans mercenaries to serve in the army of Indian rulers. The pay was marvelous. General Jean-Baptiste Ventura, an Italian mercenary, who served under Maharaja Ranjit Singh in the early 19th century, reputedly earned 2,500 rupees a month—nearly five hundred times the pay of a regular Indian soldier. He retired to Europe a rich man and lived comfortably until his death in 1858. John Hessing died in 1803 defending the Fort of Agra. On his death, his wife and his sons paid tribute by erecting a grand tomb in the shape of the Taj Mahal. Because of her limited funds, Ann Hessing wasn’t able to afford marble. 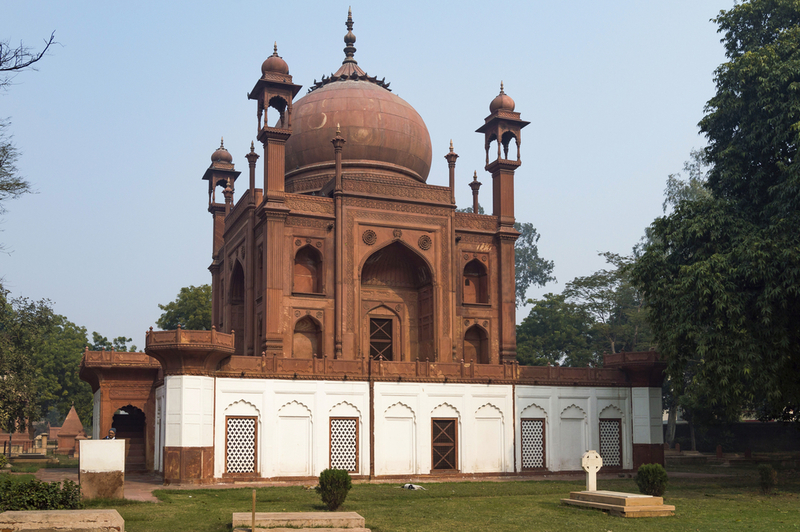 Instead, Hessing’s tomb was built with red sandstone, which earned it the name “Red Taj”.